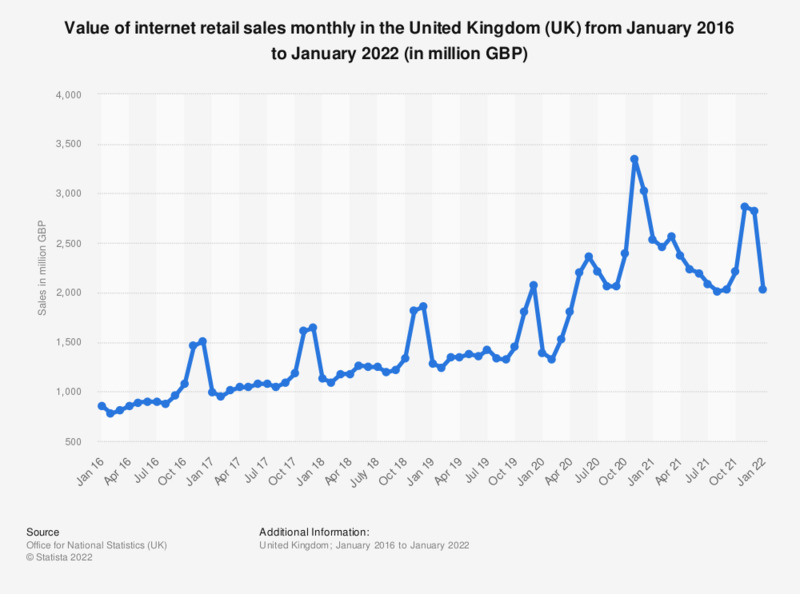 This statistic displays the value of internet retail sales in the United Kingdom (UK) monthly from January 2016 to February 2019. In February 2019, sales reached a value of 1.19 billion British pounds. In December 2016, the value of online retail sales peaked at approximately 1.5 billion British pounds and decreased to around 992 million British pounds in January 2017. Overall the value of internet retail sales has steadily increased with peaks during the winter season, reflecting sales increase from the holiday season. E-commerce retail sales have been increasing steadily in conjunction with mobile commerce retail sales which are projected to increase to approximately 29.04 billion British pounds by 2018. Total e-commerce sales in the UK amounted to approximately 533 billion British pounds in 2015. In 2015, the UK had the third largest e-commerce market in the world. Further information on e-commerce in the UK can be found in the Dossier: E-commerce in the United Kingdom and in the Dossier: Internet industry in the United Kingdom. * Values are seasonally adjusted and at current prices.